Designation: Biology Department, The Polytechnic, Ibadan. List of Author(s): Oyedele TA, Fatoki OA, Oyekanmi J, Kehinde IA. Copyright: © 2018 Oyedele TA. This is an open-access article distributed under the terms of the Creative Commons Attribution License, which permits unrestricted use, distribution, and reproduction in any medium, provided the original author and source are credited. Stored melon seeds are infested by fungi which cause loss of quality and consequently of the seeds at various stages of deterioration. Field pests of this important seed have been numerously enumerated and conventional methods have been used to determine the identity of the pathogens. In addition to previously used techniques, this study was carried out to identify fungal pathogens of stored melon seeds and assess information provided by the phylogenetic relationships. Discoloured and mouldy seeds from four markets each in four towns in each of the six states were plated directly on freshly prepared agar. Cultural, microscopic and molecular characteristics of purified isolates were determined. 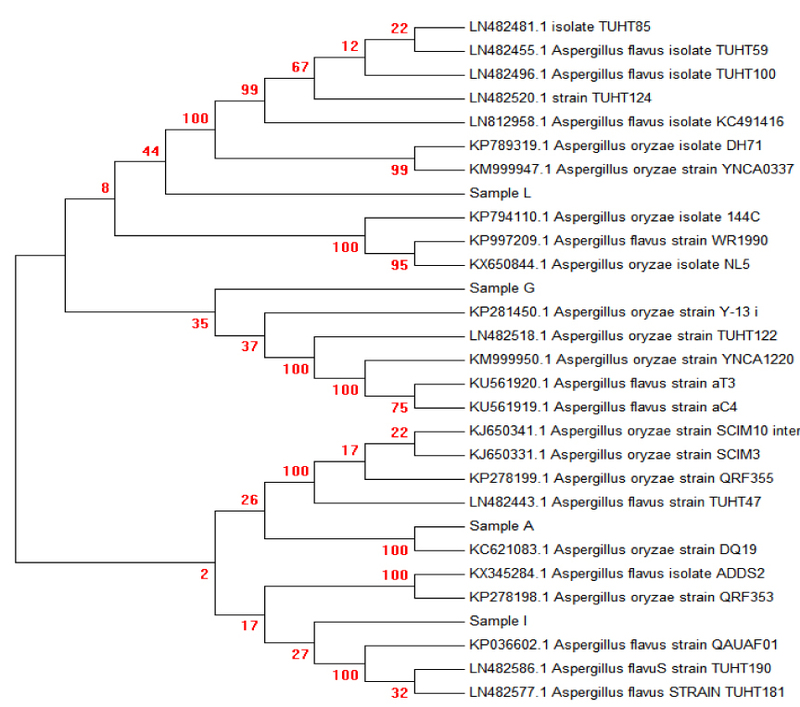 One hundred and eight fungal isolates were obtained and identified as strains of C. lunata, A. flavus, A. oryzae, C. geniculata, F. equiseti, N. sitophila, L. pseudotheobromae and P. simplicissimum. Fungi, Melon seed, Nigeria, Molecular characterization. South West Nigeria is a geopolitical region consisting of six states mostly having tropical rainforest that supports growth of melon. Melon (Citrullus lanatus) is a widely cultivated and consumed oil seed crop in West Africa . It is an important crop plant and vegetable in Nigeria, cultivated for its edible nutrient-rich seeds popularly called “Egusi” . Melon seeds are of different varieties which include: Citrullus lanatus, Colocynthis citrullus and Citrullus vulgaris. The seeds are usually small, flat and oval containing a white cotyledon in a thin walled shell with a thick ring around the edge . These seeds which are high in protein (34.86%) and oil (42.29%) also contains minerals such as Sodium (162.76ppm), Potassium (8.28%) and Calcium (1.49%)  are used as condiment in enriching the taste and appearance of local stew  as well as being applied for many other uses that include the extraction of its oil and the preparation of snacks and soup thickeners [5-7]. Despite the importance of melon seeds and the nutrients present, it has been reported as a disease reservoir  due to infection by field and storage pathogens which secrete mycotoxins, cause seed discolouration, decrease nutritive value, increase fatty acid and peroxide values and decrease seed germination [9,10]. As it is currently available, the sequence of the conserved region in the pathogen’s genome can assist in their proper identification while providing information to understand variations and develop effective management strategies. Melon seeds were randomly collected from four different markets in four towns in each state of the South Western geopolitical region of Nigeria. The seeds from each market were carefully subjected to scrutiny and the discolored, visibly mouldy and physically distorted seeds were separated. Twenty seeds from the separated samples from each market were randomly selected and disinfected by rinsing in 1% sodium hypochlorite solution (1% NaOCl) for one minute, followed by successive rinses in distilled water. Eight seeds were plated in Petri-dishes containing Potato Dextrose Agar (PDA) to which 0.3% chloramphenicol was added . The plates were incubated for 5-7 days at 28±2°C. Representative colonies of the fungi which appeared on each plate were subcultured until a pure culture of each isolates were obtained. The cultural and morphological characteristics were determined and compared with a standard reference . This was done using standard techniques involving Extraction of DNA, Polymerase Chain Reaction using forward primer ITS-1 and reverse primer ITS-4 and sequencing. The sequences obtained were compared with the database of nucleotides in the Genbank and a phylogenetic tree was plot. 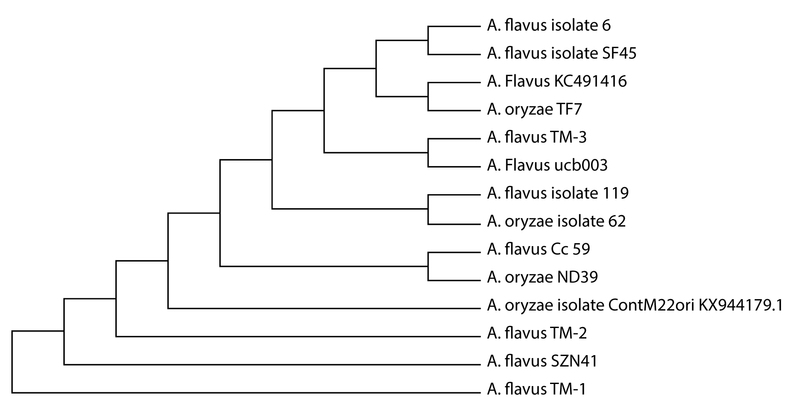 The identity of the isolates which was determined by molecular characterization shows that they bore similarities to strains of isolates in the Aspergillus, Curvularia, Fusarium, Neurospora, Lasidioplodia and Penicillium genera except for three that were 100% similar to A. oryzae TF7, Curvularia lunata ZCL3 and Penicillium simplicissimum NPF-5. Also found in the stored melon seeds were other species of Aspergillus including A. oryzae and A. niger. However, due to the ubiquity of A. niger and Rhizopus oryzae confirmed by its isolation in previous researches, its presence was only noted and not used in further investigations (Figure 1-2) . Phylogenetic tree showing some related isolates from stored melon seeds. Figure 1: Phylogenetic tree showing some related isolates from stored melon seeds. Figure 2: Phylogenetic tree showing some related isolates from stored melon seeds. The relatively balanced distribution of nutrients in the seed makes it an ideal substrate for growth and metabolism of various fungi. Though with a high protein content (including essential amino acids), it is known to also contain ash (minerals), carbohydrate, vitamins and fibre  in addition to the low moisture content which is preferable for the formation of hyphae, mycelium and spores by most field and storage moulds (Table 1). Table 1: Identification of isolates obtained from stored melon seeds. Though sample B was identified as C. lunata, the phylogenetic tree shows a close relationship as well as a common ancestry with Cochliobolus species. Previous findings have shown that Cochliobolus are teleomorphs of Curvularia . Isolates D and M which are members of the genus Curvularia were also found to be closely related bearing similar ancestry to isolate B and the teleomorph to this genus. Furthermore, while all the isolates have been found to infect or colonise various plant parts, some representatives of Curvularia genus have been isolated specifically from melon seeds. The evolutionary history as shown by the phylogenetic tree in Figure 1 also suggests a close relationship between A. oryzae and A. flavus isolated as well as other similar members of the same species. This is not novel since it has been previously established that there exists a homology (about 99.5%) in the genome of both species hence suggesting their descent from the same progenitor (probably a strain of A. flavus) . Furthermore, Kehinde  investigated the field pests of melon and of the 11 isolates obtained from different plant parts in that study, only A. flavus was found in storage during this study though representatives of Fusarium species were also isolated.